How to generate an appealing Certificate template of Appreciation? Download this Certificate of Appreciation template now! Great performance, effort, service or quality should be rewarded! By awarding someone this Certificate template of Appreciation you will capture your receiver's attention for sure! The right stimulation will come back to you, which will help you to achieve mutual goals faster! Do you have a friend, colleague, trainee or employee you like to put in the spotlight and give a Certificate template of Appreciation? But you don’t have the time, the design skills or know-how. We offer free certificates to print for Word. They are easy to hand out and useful for all kinds of occasions. Check out our collection of 100+ professionally designed certificate templates to download and create your personal certificate directly. This is the perfect solution! 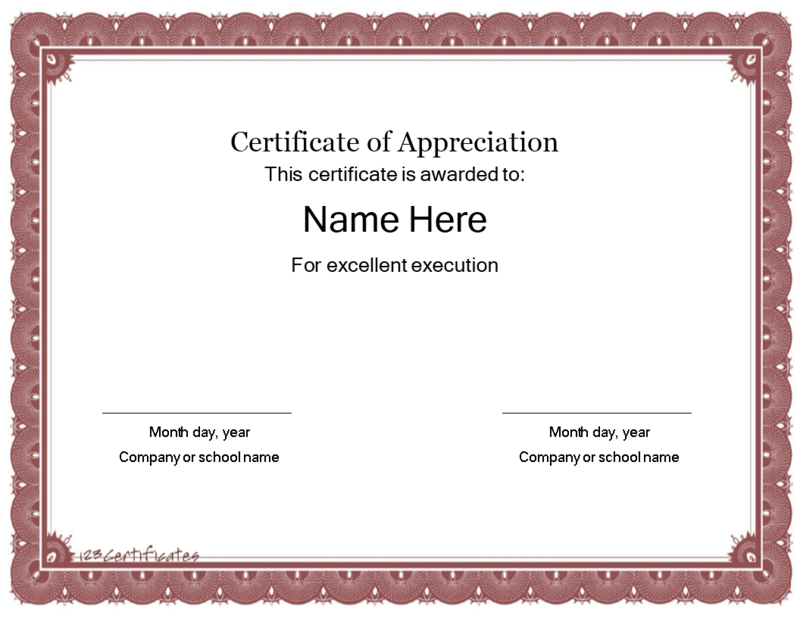 Download this Certificate of Appreciation template and customize e.g. content, text position, change the fonts, add your own pictures, logos, style, typography, details, and appearance of your personalized good looking award directly.